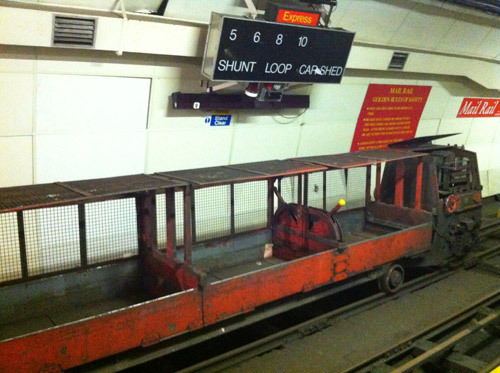 Many people have heard of Mail Rail, AKA the Post Office Railway, the driverless electric railway system that moved post under the streets of London for more than 75 years, but few have had the opportunity to see it. Mail Rail was constructed in the 1910s and 1920s, and its six and a half miles of tunnels were built to connect eight different sorting offices and Post Office buildings between Paddington and the East End. Over the years the Post Office and Royal Mail sold some of these buildings, and Mail Rail eventually ceased operations in 2003. While the network is still maintained, BPMA has been undertaking work to conserve some of this unique rail system. 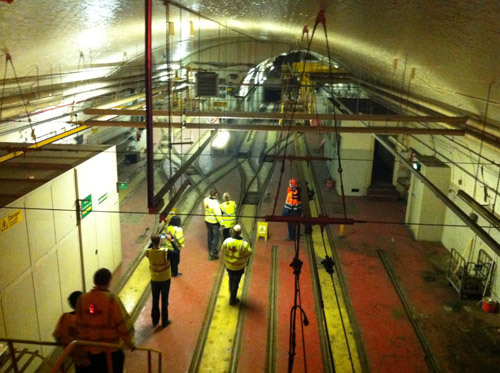 As part of this project a group of BPMA staff recently toured the Mail Rail site at Mount Pleasant Sorting Office. To get to Mail Rail you need to pass through a baffling series of doors and corridors before descending a staircase which takes you to the car depot and workshop. 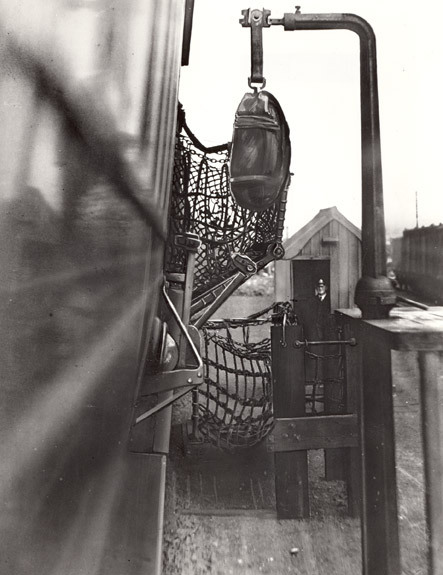 Here engineers serviced and repaired the network’s rolling stock, which once ran 22 hours a day, 7 days a week. While some rolling stock has been removed and conserved as part of our conservation project, some remains where it was when Mail Rail was in operation. The car depot and workshop. A walk through another series of doors, corridors and staircases took us to the station platforms at Mount Pleasant. Mail Rail engineer Ray explained that at its peak Mail Rail ran a “6 minute service”, with a new train of mail arriving every six minutes. Staff worked quickly to remove mail for Mount Pleasant and to load mail destined for other offices. 1980s Greenbat mail train on the Westbound platform. There was a great camaraderie between Mail Rail staff said Ray, and most spent their entire careers working on the network. This is evident when you walk along the Mount Pleasant platform: staff have added a dartboard, done paintings on the wall, and even mounted a display of stamps (which presumably fell off items of mail) near one of the mail bag chutes. 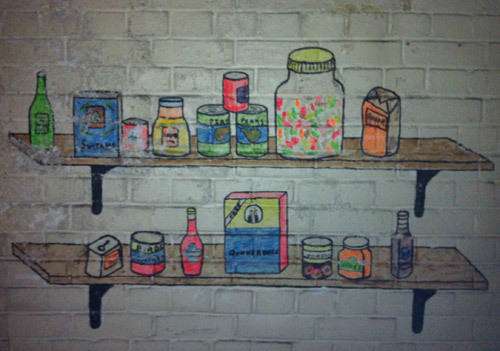 Painting on the wall of the Mail Rail eastbound platform, Mount Pleasant. 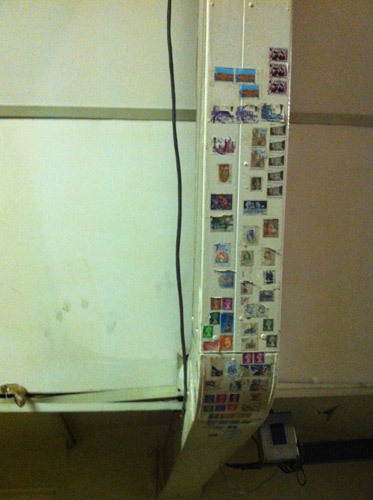 Stamps stuck to the trunking near the mail chute, Mail Rail Mount Pleasant. 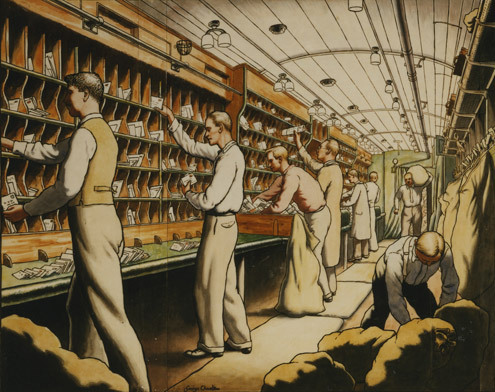 Visit our website to support our Mail Rail Conservation Project, and to add yourself to the Mail Rail mailing list. See more images from our visit to Mail Rail on Flickr. 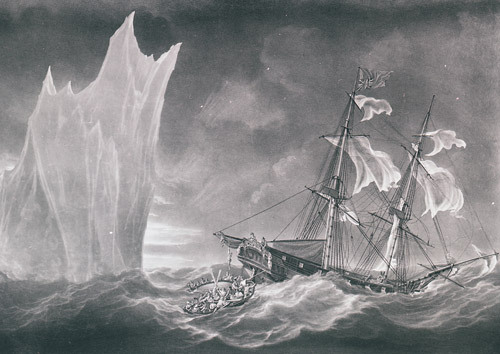 We have recently uploaded a new podcast, a recording of our Curator Julian Stray’s recent talk Disaster at Sea! 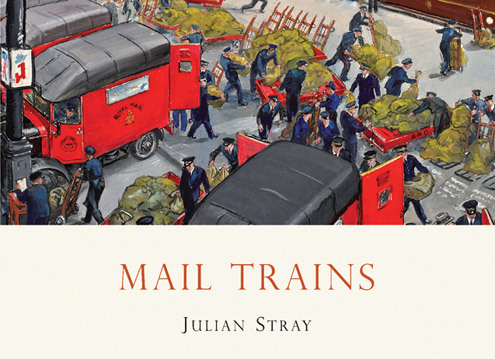 In his talk Julian Strays looks at the handful of mail ships (and one mail train) which never reached their destination. Also discussed is the Tay Bridge Disaster, in which a railway bridge collapsed during a storm while a train carrying mail was crossing it. You can listen to Disaster at Sea! on the BPMA podcast webpage, or subscribe to the BPMA podcast with iTunes. BPMA podcasts are available free of charge.